Who needs snow to build a snowman when a tumbleweed will do? In colder parts of the country, making a snowman most likely does not require pruning shears, wire, spray paint and tumbleweeds. But this is sunny Elysian Park, where this morning volunteers from Echo Park and Solano Canyon gathered to assemble the first of a trio of holiday decorations made out of tumbleweeds. The volunteers offered to help after Elysian Park maintenance supervisor Mark Jackson said last week that budget cuts left him without staff and time to create the tumbleweed figures, which had for many years appeared in several places in the park following Thanksgiving. Given the late start, there will be only three snow figures this year and the tumbleweeds, usually picked from a dump in Griffith Park, were harvested from the area near Rio de Los Angeles State Park in Cypress Park. This morning, seven volunteers learned how to prune, wire and then install the tumbleweeds under the guidance of park workers, including Laura Towels, who had overseen previous tumbleweed to snowman transformations. 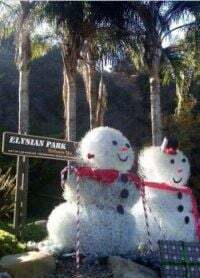 After about hour, an approximately 12-foot high snow man stood in the Elysian Park maintenance yard awaiting a coat of white spray paint and a hat, eyes, buttons and nose made from recycled plastic buckets and traffic cones. The volunteers are scheduled to return next Friday at 9 a.m. to finish the figures after they have been painted. More volunteers would be welcome. Volunteers: Lisa Baca-Sigala, Cesar & Rosie Betanzos, Meredith Hammon, Connie Kruzan, Nancy and Daniel Reza and Shira Tarrant. Park staff: Arthur Elba, Joe Horta & Laura Towels.